Hyderabad, August 11, 2016: Synchrony Financial (NYSE:SYF), a premier consumer financial services company with 80 years of retail heritage, today donated Rs.6,00,000 to L V Prasad Eye Institute (LVPEI), which will support vision care for 300people. 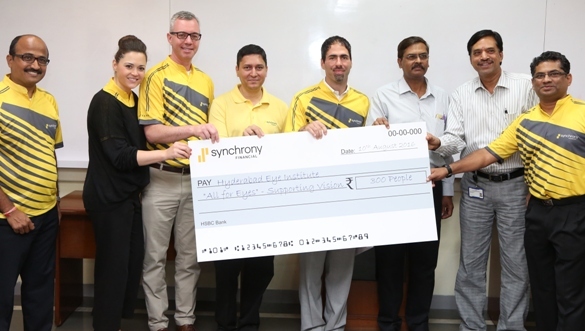 The cheque was presented to the staff of L V Prasad Eye Institute by Mr. Max Axler, Financial Planning & Analysis Leader at Synchrony Financial, and Mr. Faisal Uddin, Sr. Vice President and Business Leader Synchrony Financial India. Corneal disease is a major cause of blindness in India and there is no proper medical infrastructure to address the problem. Synchrony Financial India initiated the All for Eyes project with L V Prasad Eye Institute by supporting corneal transplant and surgeries for the poor. The project, which started three months ago, has already provided vision care for 300 people through contributions and volunteer work by Synchrony Financial employees.